The time has come to welcome all Americans to the country’s new 1 Personal Year Cycle. We’ve been asked over the past year within the 9 Personal Year of 2014-15 to honor release, letting go, and by rising up in our courage, ultimately clearing the space as our nation concluded a 9 year span of time which began in 2006. Mars’s calling and guidance over the 9 Personal Year brought the nation to a certain sense of feeling conflict for whatever may have been resisted to about the country’s requirement to release. While many may not feel change is necessary, it became inevitable – and a courageous warrior presence is what truly conquered the battles needing to be fought over the past year. Those who have listened carefully to this call, will find what comes into USA play over 2015-16’s cycle within the next 1 Personal Year, is able to be responded to all the easier on a cleaner slate. There is a specific formula to follow now in the months ahead, which undeniably requires that the USA must apply what it has learned through the experiences that the 9 Personal Year unfolded. As we explore the true request of the entire 19 energy governing over 7 + 4 + 2 + 0 + 1 + 5 = 19/1, we find the Chaldean’s ancient understandings still amazingly apply in this modern day world. If the free will of the USA chooses to adapt to embracing change, stepping into the heart space, exercising benevolence and opening new mindsets to recognize protection is possible, the country will soar through the 19/1 Personal Year’s lessons ahead with flying colors. As a 1 Personal Year Cycle, the energy of the 19 presents both positive and negative energy to choose from, depending upon what the free will’s actions wish to make. Visualizing the USA with the Sun shining brightly upon it is a marvelous place to start. Proper focus in this numerological cycle promotes enterprising opportunities, innovations, generosity and plenty of self-reliance for making the necessary changes the nation is poised to do. Energetic leadership strengthens the year ahead, to bring genuine inspiration to be able to take up in new directions as these fresh seeds are planted. The flip side of a 1 Personal Year under the influence of the higher vibration of the 19, forewarns of being fully aware and in true understanding to avoid aggressive, selfish, resentful, over-bearing, dictatorial, fickle and bullish potential outcomes to occur. The Sun, who is The Life Force, is the planet that expresses original and initiating action, and it is he who is in charge during this 1 Personal Year cycle. A planet that certainly does love to shine it’s light, there is a tendency for too much heat through it’s fire element that can scald and burn from the energy that is cast off. So a pace of relaxed intensity about what is new is also extremely required. Having faith is key, but not the foolishness of what blind faith results in. The true advice of how a Current Personal Year Cycle via numerology coincides and works with the natal chart via astrology is understood though their connecting force of the planets. It is where the guiding planet of the Current Personal Year currently transits within the natal birth chart that lends more powerful insight as to how to see a bird’s eye view of timing. For the USA, the current transit of The Sun in Cancer begins it’s 1 Personal Year within the natal 7th house where I Relate, which governs legalities, partnerships, one on one relationships of all kinds, including marriage. As the most recent events upon 26 June already unfolded, one huge step for the nation was the Supreme Court passing of equal rights to gay marriage in all 50 states. Quite the new beginning indeed as the business agreement that is the legality of marriage sees a new light of day. Simultaneously, the country’s 9 Personal Year was coming to a close as Mars also currently transited the USA’s natal 7th house. There was an equal conclusion here that ended the previous judgment, discrimination and conflict that surrounded gay marriage. What an amazing feat and achievement in a 9 Personal Year to have rose up in courage, where standing up for what was right was absolutely adhered to. So much collective fear was released for our nation, and what a gracious gift that is! Within any given Current Personal Year, there is a specific month-to-month breakdown that offers deeper guidance of how the requests of the year ideally will be seen to unravel. Just like our recurring 9 year cycles, the personal months within any given year also follow in the same pattern of 1-9. Cross-referencing back to astrology, as The Sun is the planetary focus via astrology’s current transits, these areas of life will equally be highlighted, working side by side with the personal months as the entire 1 Personal Year plays out. These areas of the life will be the timeline of how this year’s cycle of endings and conclusions will naturally unfold for the nation as a whole through 04 July 2016. So Fellow Americans, are you ready for all the “if it is NEW it is for YOU” in the next twelve months? We offer one final piece of star secrets wisdom for our country’s New Year in 2015 as a whole new 9 year span of time has now begun. Via Lexigrams -the poetic phrasing of the anagrams that can be derived from any word, name or title to spell out its’ truth- it will be ever so important to honor the request of the VISUALIZATION as the perfect guide for this 1 Personal Year. May all Americans find the time to anoint their soul to the vision they want to see by planting positive intentions now in order to receive this cycle’s rewards. As Neil Diamond once sang, “Turn on your heart light.” It’s time for America’s Best. Happy Independence Day Dear American Stars. Times are a changing all across the world right now due to the upcoming official alignment of The Grand Cardinal Cross, which kicks off it’s 6 hits of 4 planets (Uranus, Jupiter, Mars and Pluto) mathematical meeting at the 13 degree of our Cardinal Leadership signs (Aries, Cancer, Libra and Capricorn) 20 April and completing upon 23 April. For The United States of America, as a Cancer Sun sign nation, this astrological event is profoundly affecting our natal birth chart that was born 04 July 1776. Looking at the current transit chart for the USA, we have multiple aspects (mathematical conversations) that are already ongoing and will be intensely occurring surrounding the 19 to 23 April. 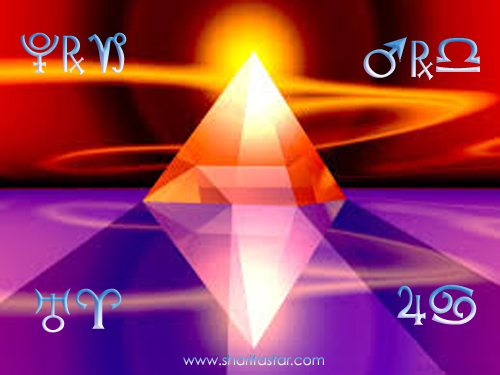 19 April: Mars Retrograde 14 degrees Libra conjuncts the USA’s natal Saturn in the Career & Public Life. This conjunction directly affects the energy connecting to our responsibility within the public eye and how we choose to structure how we work as an entire nation. Quick, conflicting, explosive, and aggressive outcomes have the potential to unfold- marking a dynamic shift in how the USA views authority and the country’s entire sense of stability, equally stimulating circumstances that will require patience, diligence, and learning from the experiences to unfold. One might say the USA has “lessons to learn” in reflection of the previous efforts and intentions that have already been placed in motion. This conjunction point at the 14th degree is the Chaldean’s understanding of Movement – Challenge, which clearly indicates permanent and irreversible changes are more than likely to unfold here. Note as well, as The Grand Cardinal Cross makes all the conjunctions, oppositions & squares to our nations’ 13 degree Cancer Sun, these aspects are profoundly “talking” with our natal 14 degree Saturn in Libra. Now, you might really grasp a deeper picture of why the energies around the USA are nothing short of intense. What can we possibly expect as a nation upon these dates in 2014? As always, the way that the letters composing a title are able to provide further wisdom and insight into what we can all expect -beyond the USA’s implications, within the world at large- when we anagram them and then poetically phrase them to spell out the truth, we have the final clues as to what this rare period in history ultimately requests of us all, whether one is an American or not. While this planetary alignment strongly affects the USA, the rest of the world is not excused from adhering to what it wishes for anyone to pay closer attention to. Our country at present is wrapping up a Current 8 Personal Year Cycle, which began 04 July 2013. While April marks a 3 Personal Month of learning, growth, finding optimism and seemingly a stroke of “good luck,” it’s higher vibration comes from the 12, indicating the Chaldean’s deeper insight of Sacrifice – The Victim. What is going to be asked of the nation is to allow circumstances and events to become our teacher however they unfold- as the USA is called to become “the kneeling submissive student.” Within this entire year’s cycle that requests patience across the board and a sense of responsibility to mark every move our country makes, April overall surrounds us within the learning process, and one that will demonstrate -if we have not allowed our actions to be within honesty and integrity- the force of the 12 and the association with sacrifice and the potential to become the victim is likely our outcome. Whatever may be unfolding within the nation that falls under the repetition of action that keeps striving for a different result, but no alternative approach has been taken, we find we may be accused of operating within the definition of insanity. Looking further into the Personal Day Cycles, we also gain perspective with 19 April falling to 4 Personal Day, there is a calling for a new structure and foundation to occur – happening completely unexpectedly- throwing an obstacle our way to learn to overcome as a great level of tolerance will be associated with it. On 20 April, as we turn into a 5 Personal Day, this marks a date that will bring forward a permanent change that will move us into events and occurrences that present us with historic moments of never going back again. As we look to the nations’ upcoming “new year” that officially starts upon 04 July 2014, we enter a 9 Personal Year, marking the end of a 9 year cycle that began in 2006. A 9 Personal Year always brings along with it a period of release, conclusions, endings, and pure cleansing so that by 2015, another 1 Personal Year can begin for the USA. The motto, “if it is new it is for you” will become the theme of 2015 to 2016’s cycle, as a brand new 9 year span of time in our evolution starts. 2014 to 2016 is extremely pivotal energy that surrounds our country and the natural occurrences one will see unfold. What is also of high alert in a 9 Personal Year Cycle is the leaning towards aggression, conflict, anger, and penetrating energies that will not be afraid of a fight to stand up for change. As always with any association of the 9, it is rising up in courage, and taking a stance as a warrior that will bring forward the proper grace, so that it does not gravitate to being out of control. 9 energy in its’ negative form, is nothing short of disastrous and painful on extreme levels. Will The United States of America become the warrior in its’ own right? More than likely, the answer to this question is no, but if we have captured your attention to reading through to the end of this entry, only you -if you are a fellow American- can truly answer that for yourself. No matter what mass media, propaganda, or circumstance beyond your personal control happens within the USA in the next three years- you have a personal responsibility to allow your free will to reflect the outcome of change you wish to see within this country, no matter what apparent chaos is surrounding you from anywhere within the world. Whenever we follow the eye of the storm, we always have the wisdom to navigate clearly in HEART upon our EARTH in the LOVE to EVOLVE. Remain vigilant, alert and in your peace of mind Dear Stars.